5th year Pic 172 - 11-May-2014. 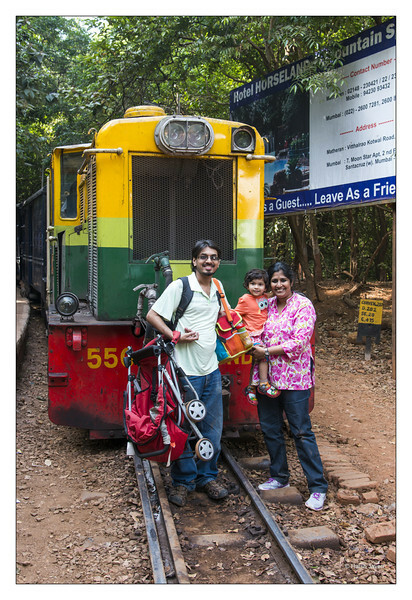 Matheran, situated 90 kms from Mumbai; is a famous and one of the coolest (temperature-wise!) hill stations situated in Maharashtra, India. It is the smallest hill station of India and is located on the range of the Western Ghats at height of 800m (2625 Feet) above sea level. The name Matheran means either ‘Forest on Top’ or ‘Woodland overhead’. The unique 'feature' of Matheran is vehicles of any kind are not permitted in the town, which makes it a very quiet, serene place. Once you enter, red dusty pathways welcome you to nature. Porters are available to carry luggage. You can enjoy the walks through the red pathways or ride on horses. Manual 'rickshaws’ are also available; each rickshaw is 'driven' by a couple of operators. Cars are allowed to go up to the edge of the town from where a 30-40 minutes walk takes you to the centre of Matheran. From Neral - a town at ground level - a small Toy Train (Narrow gauge) takes you through a zigzag route of about 21 kms. to Matheran in two hours time.